Best Trees to Plant for Added Shade | Mr. Tree, Inc.
As winter winds down and warmer temperatures lie ahead, you’re probably thinking about doing some outdoor gardening or landscaping. But with the summer months just around the corner, you might eventually be looking for a cool retreat from all of that hard work in the front yard. We’ll go over the best trees to plant for shade and to find the perfect place to seek cover from the sun’s harsh rays in the years to come. If you’re uncertain of what type of tree will flourish in your yard, contact an arborist like us at Mr. Tree to assist with tree services in the Oregon area. It’s best to seek an expert opinion than take the time to plant a tree that will never fully flourish. But here, we’ll outline some of our top picks to help you get started. 1. Northern Red Oak: If you have a large backyard and want a fast-growing tree, then the northern red oak could be the perfect choice for you. The northern red oak tree is best planted in wide, open spaces because of the light intensity needed for it to grow. If you have enough space, the northern red oak can be a great tree for shade because of its height and leaf density. Additionally, northern red oak trees can thrive in much of Portland’s urban landscape so long as they have adequate room to grow. So plant some roots (or in this case, seedlings) and give the northern red oak the space it needs to grow old enough to throw you some shade. 2. Hybrid Poplar: If you don’t have a sprawling backyard, you may want to opt for hybrid poplar trees instead. Hybrid poplar trees grow vertically. While they lack the sprawling canopy typical of many other shade trees, they can be a great addition to your home’s landscape. Lining the driveway with hybrid poplars can be an excellent way to spruce up your front yard while also blocking the sun’s rays. When planting a poplar tree, be mindful that the tree’s roots can grow up to two or three times its height and have the potential to be disruptive. 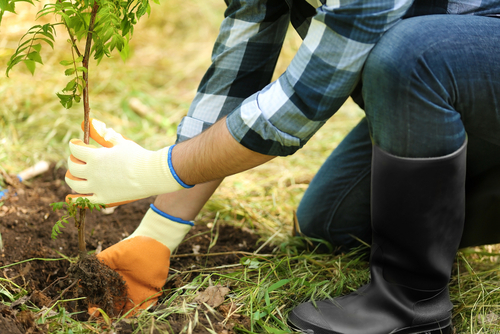 If you’re uncertain of where to plant the tree, consult your local arborist who can provide helpful assistance and information about tree service in Oregon. 3. Wax Myrtle: If you’re looking for something not quite as sprawling as the northern red oak or not quite as tall as a hybrid poplar, the wax myrtle tree would make an excellent choice. Wax myrtle can be grown as either a tree or a shrub and would make a great addition to your deck or patio. Wax myrtle trees also have the added benefit of being extremely versatile so they can be grown in a variety of areas. They can withstand both droughts and floods and they fare well in both sunny and shady areas. If you want a tree that provides optimal shade with minimal maintenance, the wax myrtle would be the right fit. 4. Tulip Tree: The tulip tree, also known as tulip poplar or yellow poplar, combines beauty with functionality. This tree is considered both a shade tree and an ornamental tree because of its blooming blossoms. The tree can grow to great proportions, reaching heights up to 90 feet. Like the northern red oak, a tulip tree’s spreading canopy means it is best grown in areas with lots of space. It’s best planted in a large front yard of a suburban home rather than in an urban landscape. Tulip trees grow at a rapid rate, but they still require a good amount of patience. The tulip blossoms typically don’t appear on the tree for at least fifteen years. 5. Weeping Willow: If you’re looking to make a statement with your choice of shade tree, then the weeping willow tree fits the bill perfectly. With a height typically ranging from 30 to 40 feet and a width of similar proportions, the weeping willow is considered a gentle giant. With its low hanging branches, the weeping willow will comfort you on a hot, summer day. In fact, according to its rich lore, the weeping willow tree has been providing comfort for years. It is believed that after his exile to St. Helena’s island, Napoleon Bonaparte used to sit under a weeping willow tree to seek reprieve. In fact, Bonaparte enjoyed seeking solace under the weeping willow tree so much, that he asked to be buried under its shade following his death. Presumably, the tree’s shade can be enjoyed in the afterlife but you needn’t wait that long. A weeping willow tree typically matures in 15 years. Keep your Portland trees trimmed for healthy growth and let Mr Tree maintain them each year. 6. Sugar Maple: Another way to make a bold statement is with a sugar maple tree. Like the name suggests, the sugar maple tree is often tapped for its sweet maple sap. But it’s also an ornamental tree known for its striking fall foliage and a shade tree because of its spreading canopy. This multi-functional tree is pretty to look at, sweet to taste, and perfect to lay under on a sweltering day. When deciding what trees to plant, you should consult the U.S. Department of Agriculture’s plant hardiness zones to ensure that the type of tree you’ve selected will flourish in the local climate. There are 13 plant hardiness zones throughout the country, with each zone having two subsections. The Portland area, for instance, is covered by zones 8b and 9a. Both the northern red oak tree and weeping willow tree can be grown in zone 8, but they probably wouldn’t be well suited for residents in the 9a area. Hybrid poplar and tulip trees, on the other hand, would fare well in both zones. If you’re located outside of Portland or are simply confused about what zone you’re located in, contact your local arborist for tree shaping service information specific to the Oregon area. At Mr. Tree, we can help you assess exactly what type of tree will throw you just the right amount of shade without being a shady investment.